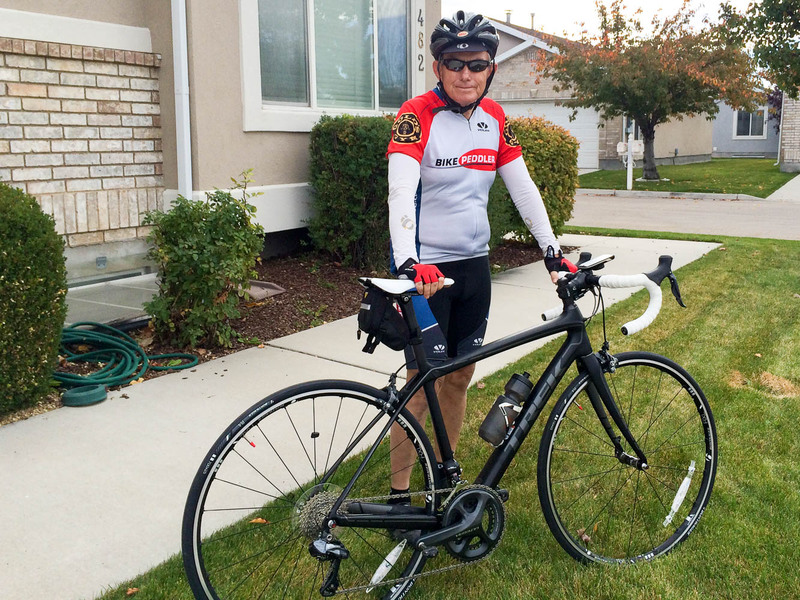 I have had a long experience with Trek bicycles. My first Trek, which was my second road bike, was a Trek 5200, which is still being using by one of my sons. In 2006 I decided to get a new bike, buying a Trek Madone 5.9 for around $4,600 new. That bike came with Dura Ace 7800 components and I thought it was a great bike. The frame later was replaced with the Madone 2009 6.9 series and then later I replaced the components with Dura Ace 7900, moving to a compact crank for the first time. Using a credit that Trek kindly gave me due to an issue with my other frame, I decided to buy a new bile. Trek now offers three different road bikes, the Domane, the Madone and the Emonda. Initially I was intrigued by the lightweight Emonda but I don’t do hill climb racing anymore and had some concern that the lightweight would come at the cost of reliability, considering I don’t get a new bike every year or two. I had been riding a Madone for 8 years so that would be the safe bet but I don’t like how they moved the rear brake down by the chain stay, requiring using non standard brakes. I have been intrigued by the Trek Domane with the ISO Speed link that decouples the top tube from the seat tube, with the intent of damping vibration. 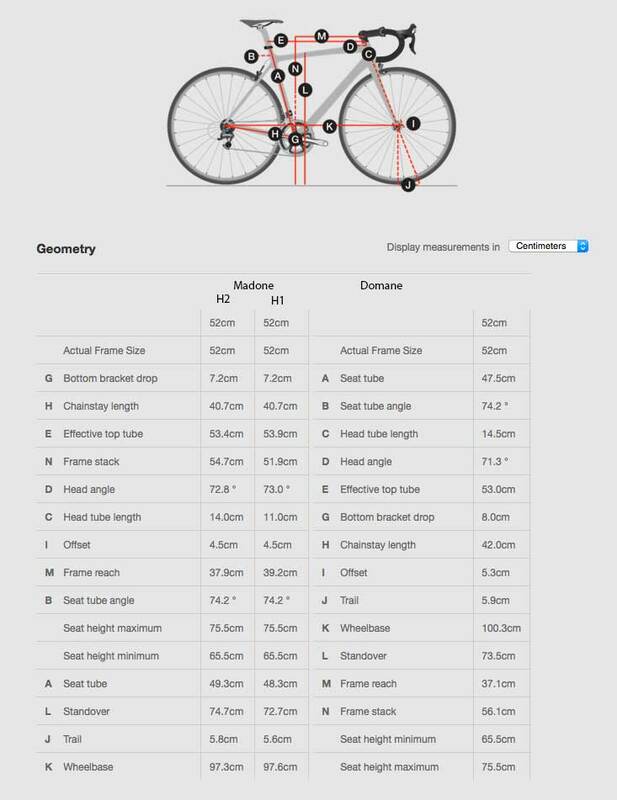 I took a look at the sizing for my prior Madone and the Domane. The Trek dealer helped me with a Trek Project One order where you can customize many options. I was only able to test a Domane a size too big for me before ordering and thought my traditional stem length of 70 mm might be too short. The effective top tube of the H1 Madone is 53.9 cm and for the Domane it is 53.0 cm, so I went with a stem that was 10 cm longer. Once I decided on the Domane, the next decision was the drive train. I have been riding Dura Ace mechanical for many years and thought about that, but my younger brother suggested I try the electronic Di2. When I checked the Trek Project One pricing I was surprised that the Dura Ace Di2 was an additional $1,732 over the mechanical version so I looked at the Ultegra Di2 and found it to be actually $262 less expensive. That makes the price difference between Ultegra Di2 and Dura Ace Di2 to come close to $2,000. Considering I only spent $4,600 on my last new bike purchase, that seemed like a lot. 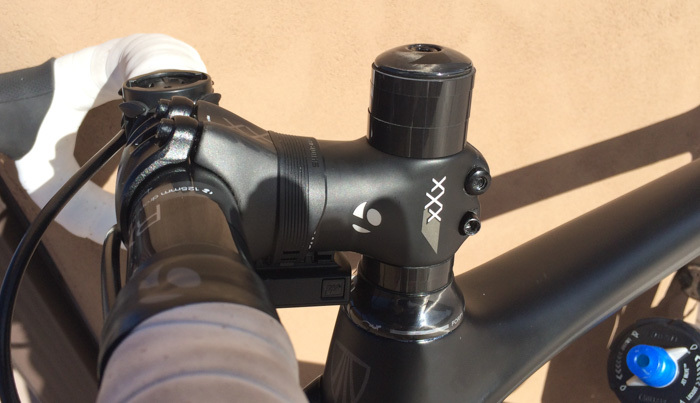 Since Di2 shifts so well, even with the Ultegra model, it came down to only an issue of weight for me. With a weight difference of only about one pound, I could not justify spending $2,000 so I decided to go with Ultegra Di2. One other advantage is that Ultegra offers a medium rear cage so it can handle a 11/32 cassette. It is not a range you usually need but I wanted that option. Besides the drive train, Project One allows you to pick paint schemes, stems, saddles, wheels and even things like color of the cables. I went with one of the four paint scheme options that does not add additional price and selected a matte black with ghost imaging lettering, which is quite similar to the Giant Anthem Advanced mountain bike I bought last year. I never understood why cyclists who are not sponsored want to have big letters like “S-Works” on their bike. They don’t drive around a car with big “Toyota” plastered on the side door. Since I didn’t want everything black, I went with a white saddle and white handlebar tape. The Trek deal did a bike fit for me. I had them lower the handle bar 10 mm by moving a space up above the steam. It was just too relaxed of a fit for me. I used that fit for the first couple of rides, then made some minor adjustments, moving the saddle back about 1/3 in and rotating the handlebars forward slightly (back to how it was delivered from Trek). I was glad I got a longer stem. I also found the handle bars much higher than on my Madone. 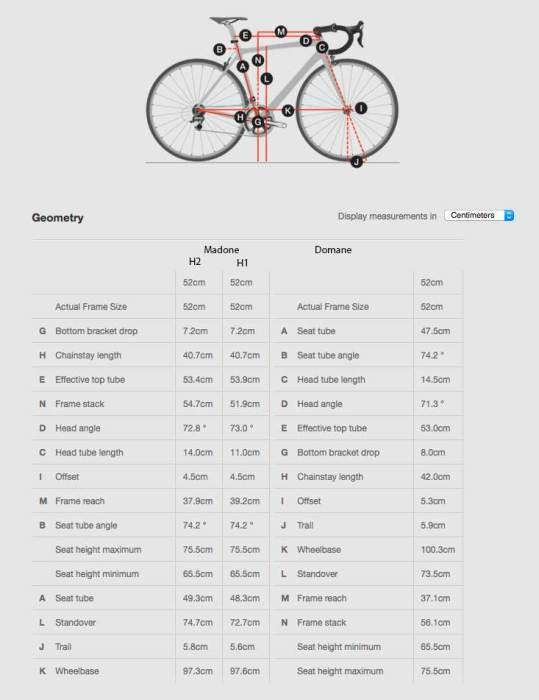 The Frame Stack on the Madone is 54.7 (H2) or 51.9 (H1). For the Domane it is much higher at 56.1 cm. I ended up moving 25 mm of spacers above the stem, which would give me a new stack height of 53.6. That is still more relaxed that my old Madone, indicating I did indeed have more like a H1 fit before. I now have a fit that I feel is even better for me than my prior Trek Madone, with a bit more relaxed fit and and room to adjust even more relaxed as I get older since I anticipate using this bike into my 70s . The bike came with 700×25 tires so I am not quite sure how much of the smoother ride is form the ISO Speed and how much from the wider tires but in any case I definitely notice a significant difference. Some of this might also be due to the 3 cm longer wheelbase. Once I get a new cassette for the Dura Ace 9000 wheels I bought last year, I do better comparison. The geometry is also much better than my Madone, which was probably setup too aggressively for me. Even though I have a longer stem, I can ride on the hoods for a long period of time, whereas before I found myself almost always riding on the tops, except if I were in a pace line, climbing or descending. I really like the electronic shifting. On the other hand I heard that the Dura Ace 9000 mechanical shifts very well. Frankly I think Shimano blew it when then went from the Dura Ace 7800 to the 7900 shifters because I found the front derailluer to be much harder to shift into the big change ring. This was one reason why I wanted to go with Di2. 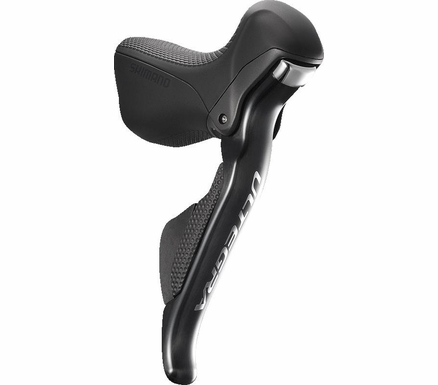 Also I am getting older and many older people prefer the Di2 as they might develop some mobility issue with their fingers. I Project One ordered the bike with the 11/32 cassette since I wanted to make sure I got the medium cage derailleur. 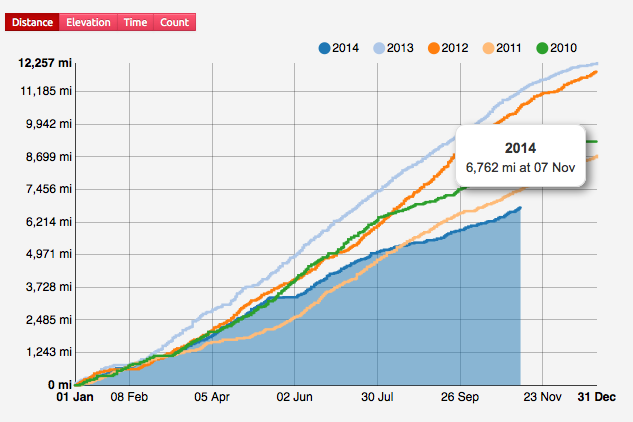 I don’t think I need that low of s gear since we have moved away from California and it’s steep hills. but but I wanted the option. I put a Drua Ace 9000 11/28 11 sp cassette (Cost of $159 at Pro Bike Kit) on my existing Dura Ace 9000 wheels and am using currently. At a 190 grams this new cassette is a big weight savings compared with the Ultegra 11/32 weighing 290 grams. I had Michelen Pro Race 4 700×23 tires on those Dura Ace wheels and it felt quite different than the Bontrager R4 tires that came with the bike and handling felt more like my Madone. The R4 tires are also worthless since they are too thin for the area around here and I grew weary of flats. I wanted some new 700×25 tires, but the Pro Race 4 Service course doesn’t come in that width so I ordered some Pro Race Endurance Course to replace the Bontrager tires on the Race X Lite wheels that came with the bike. I needed a cassette for my other wheels so that was an easy choice to save some weight. I was wondering if I could replace any of the other components to get some weight savings. My Dura Ace 9000 wheels are already very light so new wheels is not in the cards. I did some research on Dura Ace Di2 vs. Ultegra Di2 component weights and there is no clear area where spending additional money will be worth it. I did get a new DuraAce crank only because there did not look like sufficient clearance for a Stages Power meter. That cost me $358 and when I weighed the Ultegra I took off and the new DuraAce I put on the difference was only 90 grams. The wheels I got with the bike are Bontrager RXL, tubeless read. However the skewers are RL, and weighed a total of 138 grams. I bought some Enve titanium skewers that I weight at 55 grams, so that resulted in a weight savings of 83 grams, at a cost of only $44 and saved the same weight as switching to a DuraAce crankset. I weighed my new bike after installing the pedals and water bottle cages and my Dura Ace 9000 wheels and it came to 15.8 lbs. My Madone was 15.3 lbs. After changing the crankset and the skewers, the weight dropped to 15.6 lbs, almost the same as my Trek Madone with Dura Ace 7900 components. I also have a Cycle Ops Powertap Pro wheelset I used for training on my Madone. It was not 11 speed, but I found you can get a $99 freehub to convert to 11 sp so that is on order. It was very easy to install but I still intend to order a Stages Power meter replacement left crank arm. The other think I have ordered is tubeless tires and will give a report on those after I get them delivered and installed. In the end I will have a bike that weights not much more than what I had before, fits me much better, has a smoother ride, and also sports electronic shifting, so I am happy with the changes.